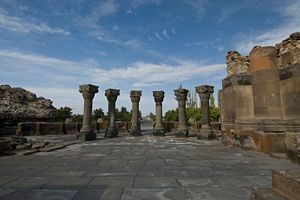 Zvartnots, a complex of structures erected in the middle of the 7th century near Ejmiatsin, is of extreme architectural value. The complex consisted of St. George temple or Zvartnots ("vigil forces", "celestial angels") and the palace of Catholicos Nerses Ill, known as "Builder". Zvartnots, built as Armenia's main cathedral in 641-661, was to suppress the Ejmiatsin Cathedral by its grandeur. This purpose was served by the original architectural composition of the building which is an example of a central-dome temple different in its appearance from the antique and Byzantine structures of this kind. The plan of Zvartnots is based on the composition of the central nucleus of Armenia's cross-winged, dome-type structures of the previous times, that is the Greek cross. However, this cross is harmoniously fitted into a circle rather than into a square. Zvartnots' architecture was supposed to impress the onlooker by its extraordinary artistic splendor. This determined the size of the temple, its layout and spatial arrangement, its structural features and its decoration which emphasized the central axis of the building and its upward sweep. According to Stepanos Taronatsi, an Armenian historian of the late 10th and the early 11th centuries, (Stepanos of Taron, known as Asokhik). 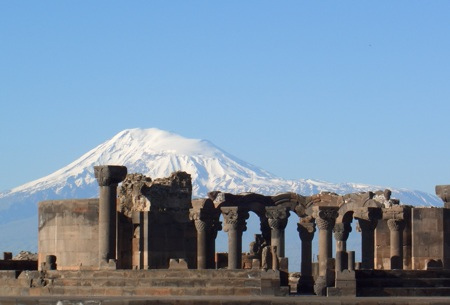 Zvartnots lay in ruins as early as in the tenth century. He does not mention the cause of destruction. The remnants of Zvartnots, even In ruins, are a majestic sight. There survived only the lower parts of the walls and individual fragments, and scientists’ reconstructions of the temples original look vary. The best known reconstruction is that by T. Toromanian. According to this reconstruction, the building consisted of three polyhedrons. the lower one being 32-hedral. and the upper one 16-hedral and crowned with a cone-shaped cupola. The central part of the interior had the shape of a tetraconch in the plan. In the joints between the apses there were mighty pylons which supported the drum of the cupola by means of spherical pendentives. Beyond the pylons there were columns arranged on the radial axis. They and the tops of the tetraconch’s semicircles buttressed the arches which served as the basis for the middle polyhedron. The tetraconch was surrounded by a two-storey gallery fenced on the outer side by a circular wall with closely spaced windows and, on the inner side, by an open arcade of the apses. The altar apse was blank. The heaviness of the cupola and of the middle polyhedron was conveyed by arches and vaults of double curvature to the pylons and columns of the apses. 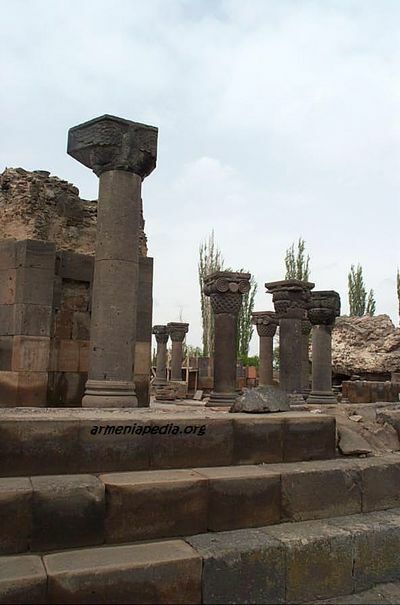 The decoration of Zvartnots temple followed the principle, common in the Armenian architecture of the 5th—7th centuries, of bringing out the basic architectural details: columns, door and window openings. cornices and archivolts. The outer surfaces of the polyhedrons, especially of the lower one, were ornamented with a rich arcature. The twin semi-columns were crowned with capitols with palmettes and acanthuses. On the whole, the motif of sculptural ornamentation, cut in high relief, was floral (a vine, stylized leaves, branches of pomegranate with fruit, etc.). The ornamental patterns are clear-cut, expressive, varied and unconstrainedly rhythmical. Standing out among them were interior column capitols of an original composition, shaped as wicker baskets with volutes and a cross or a monogram (with letters standing for "Nerses" and "Catholicos") between them and decorated with the figures of rampant eagles which seemed to support the cupola — a symbol of the firmament. In the spandrels of the outer decorative areature of the bottom polyhedron there were half-length representations of men with building tools in their hands. Some researchers believe them to be portraits of builders (the name of "Ioann" is cut near one, presumably the main of them, on the archivolt), and others maintain these are the portraits of the founders of the temple. The portraits are distinguished by a realistic depiction of faces and clothes and by the individual features of the figures shown in various postures. The rich and extraordinary interior decoration of the temple is evidenced, apart from the reliefs, by the pieces of vari-coloured smalt and tufa mosaic ornaments and fragments of murals which survived on remnants of plaster. These were found during the excavations of the altar part. 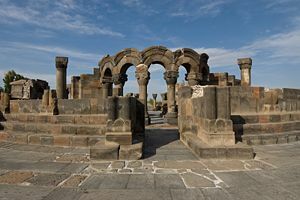 Before the construction of Zvartnots was completed, its architectural and artistic concept was embodied, by the selfsame Nerses III in the initially concentric temple in Ishkhan built in 652—659. Presumably, the architect of Zvartnots knew the Syrian and Byzantine architectural structures of the same kind. Zvartnots stands out for an unusual composition which differed from that of these structures. Syria and Byzantium had no structures of this type. This is confirmed by Movses Kalankatvatsi, a 10th century Armenian historian, who wrote about the intention of Emperor Constantine of Byzantium. who had been present at the consecration of Zvartnots when it was nearing completion in 652, to build a similar structure in his own capital. This intention failed to materialize due to the architect’s death on his way to Constantinople. Zvartnots is a monument which embodies the centuries old traditions of Armenian architects. In its artistic image and daring spatial arrangement, formed by an intricate combination of arches and buttresses, Zvartnots is an outstanding monument of world architecture, an evidence of the high level of the development of the artistic and engineering thought in the 7th-century Armenia. Its architectural idea later became widely spread and developed in new shapes and new artistic compositions. To the south-west of the temple there was the Katholikos’ palace which has also come down to us in ruins. It was a complex of capitally-built and regularly laid-out presence-chambers, dwelling, auxiliary and service premises. The scale, as well as the architectural and artistic features of the palace were coordinated with those of the temple. The palace building consisted of two parts arranged at all angle to each other and divided by a corridor. The western part comprised small premises and two halls. The big summer hall, where reception ceremonies and conferences were held, was divided by columns into three naves and communicated with the dividing corridor by an arcade. The second, slightly smaller hall, which served as a refectory and. possibly, as a throne-room, was of a more intimate character. The projections on its lateral walls reduced the span of the vaulted roofing reinforced by wall arches. The projections formed arched niches which lended artistic expressiveness to the interior. The eastern part included dwelling and service premises, such as storerooms and a bathroom. The latter consisted of two sections, the bigger one intended for common, and the smaller one for privileged visitors. The bathroom was equipped similarly to that of Garni. Adjoining it on the southern side was a small hall-type church of the 5th—6th centuries, south of which there was a large wine-press. The plan of the palace is almost a square. The small size and skylight of most of the rooms show that they had wooden roofings of the kind used in Armenian peasant homes. The open gallery with an arcade on the northern side of the eastern part and flat roofs gave this structure of a severe composition the appearance of a southern-type building. The massive arches of the arcade resting on buttresses, cross-shaped in the plan, concealed the divisions between the premises behind it. It did not only decorate the square In front of the palace, but connected its architecture with that of the temple. The palace of Nerses III was the biggest of all the known civil structures of the 7th-century Armenia. This page was last edited on 15 October 2010, at 02:00.